You ever had anyone tell you that you can’t-do something? Like they were laughing in your face, and tell you there isn’t any way in “H-E- Double-Hockey-Sticks” that you could do it in your lifetime? Doesn’t that tick you off? When I was a senior in High School, a classmate and I were playing golf with his dad, and a fellow retired buddy. During the round, on the 17th hole of the local country club, I spouted out that someday I was going to be a millionaire! Boy did I get laughed off the course? It was as if I had just said I’m going to be the first person to run a sub 2-hour marathon! At 17 years of age, this instance was drilled into my memory forever! It wasn’t leaving! I held onto the feeling of being laughed at and the thinking that someone out there thinks that I can’t-do it! Have you ever had a similar type instance where someone laughed at you? Where someone’s doubt in your abilities gets under your skin? For me, the whole point isn’t about becoming a millionaire. The point is there was someone who thought I couldn’t do it. A doubter. Am I the only one that has had someone doubt their abilities and publicly question it? Fast forward to my senior year in college, I slowly matured my agenda on how I could accomplish something that others thought I couldn’t. What worked for me was these three things that I learned in college! At the end of my senior year, I went to visit a financial advisor because I was interested in getting started in investing right after college. After an hour-long talk, on all the great (expensive) funds they had to offer, the single great thing I walked away with was his persuasion of creating a set of goals. Not just any old goals, but a lengthy goal list. One the didn’t stop at the end of the year, or one that said, “I want to have $1,000,000 by the time I retire at 65.” No. It was a goal sheet that was every five years, from age 25 to 85, and gave great detail of what I thought I wanted and didn’t only include financial goals. To this day, I still keep track of this goal sheet and write down what I’ve accomplished each five years. What my original goal was, and where I finished. In addition, I add and subtract things from my goal sheet that are changing with my priorities. Setting a goal is only one step in the process. Where the rubber hits the road is where the plan takes you to accomplish what you put your mind to! For me, my senior Quantitative Methods professor George Frangedakis showed our class how two different retirement saving scenarios had completely different outcomes. Scenario #1 – Invest $500/month from age 22 to 30, and never invest another dollar from age 30 to 65. By the time I’d turn 65 I’d have more than $6 million (assuming 12% annual interest) in retirement with only a $48,000 investment ($500 x 12months x 8 years). Scenario #2 – Invest $500/month from age 30 to 65. By the time I’d turn 65 I’d have just over $1 million in retirement (again assuming 12% interest), but I’d have needed to invest $210,000 ($500 x 12 months x 35 years). When he laid out these two scenarios it was like a light bulb went off in my head! I still remember the exact chair I was sitting in and pondered ever word and graph he presented on the board. It was like Mr. Miagi from Karate Kid was teaching me! I couldn’t believe that this was really possible! I couldn’t believe the mystery of compound interest, and how powerful it was during my young working career. So with Mr. Frangedakis’s teachings in hand, I did exactly like he said. I started to invest $500 or more per month in Vanguard’s S&P 500 Index fund just one month after starting my first career job. I didn’t live like everyone else and partied it up every weekend. But instead, I knew that my early career dollars had a higher compounding impact, then if I waited. Every five years I record where I’m at with my goals and how I’ve progressed towards achieving my goals. Ever since creating these goals, I’ve realized that this isn’t enough. What has helped the most is breaking down my goals into the smallest measurable unit. What does this mean? Well, by shrinking the overall five-year goal into a smaller daily or weekly goal, then it helps the five-year goal seem that much more achievable and not so daunting. In recently reading, “The Millionaire Real Estate Investor“, Gary Keller challenged me in recording my goals at least monthly (if not more frequently). Over the last three months of doing this, I’ve found it a lot more rewarding, and results driven. It has shown me the affects my daily decisions have on my goals, and I don’t have to wait for the end of the year. In the short term it is more rewarding, and help keep driving me towards my next five-year goal. For me, I use two primary methods for tracking my progress. First I record all my goals in Word or on google word docs. Secondly, I utilize a lot of spreadsheets to create different scenarios with “If this, then that” scenarios that help me make the best decision. In pulling out of buying a farmhouse last year, these spreadsheets were detrimental in me realizing that this house purchase wasn’t the best option for our family. Even though it has been more than 20 years since my best friends dad laughed at me, I still have work to do. I’m not at my goal and even then I doubt that my drive will stop. So are you wired similarly? Does someone’s laughter at you drive you? Just like Casey Neistat’s 7th grade vice principal doubted him. What drives you to accomplish your goal? 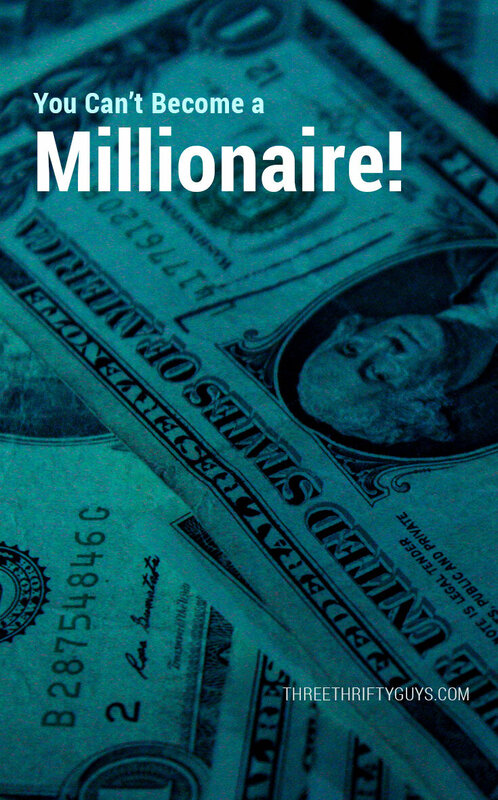 What drives you to become a millionaire or accomplish what others think you can’t? I enjoyed reading your post this morning, and will be sure to share it with others, especially my children who are at the age of getting this stuff down and then acting on it! I also have some further thoughts on this for you and maybe for your readers if you feel so inclined. As a now 50 year old educated woman who spent the first 30+ years working hard and doing her best to set and achieve goals or change them as needed, I have found myself, due to no fault of my own, in a place of having to “start from scratch” concerning my financial future (among other things). When it comes to hearing “No, you can’t”, I realize that most of the time that voice is my own, and I cannot place that blame on anyone else. As a result, I am learning how to set goals in a way that is realistic for me, but I think is a good way for everyone no matter their circumstances. Simply stated, my goals are “SMART”. This is not a concept I came up with on my own, rather it was shared with me by someone in my writer’s group concerning setting goals for writing. These can be applied to any goal and are easy to create and track. Here is one example: I want to______________because________________. In order to achieve my goal by_______________and be successful, I will_______________,______times every hr/day/week/mo. I will know I have achieved my goal when______________________________. I have also found that checking in on my goals frequently is helpful, which you made clear in your post as well. Thanks for doing what you do, and keep up the great work! !